The Valiant Movie Universe is getting a new member. Kevin Feige says a sequel to Doctor Strange is in the works. HBO’s Watchmen show adds a few more mysterious members to its cast. Jordan Peele’s new scifi anthology series is heading to Youtube. Plus, behind the scenes on Wonder Woman 1984, Chloe Grace Moretz on the Suspiria remake, and more. Spoilers get! 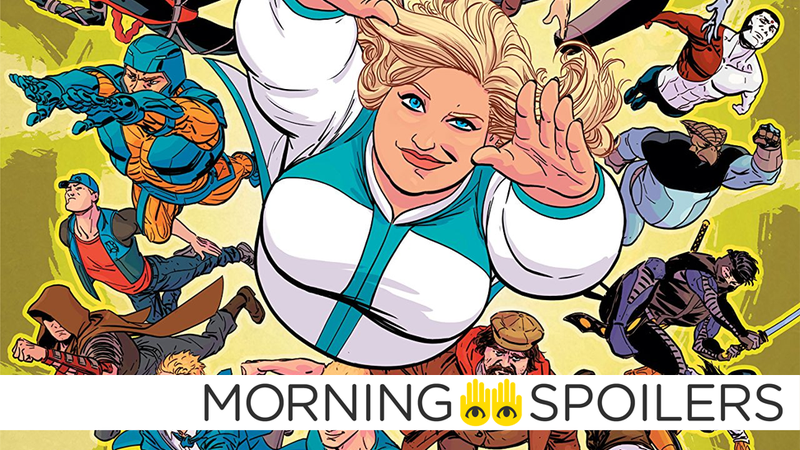 According to Deadline, Sony is now developing a film based on the Valiant Entertainment character, Faith Herbert, the geeky, plus-sized member of the Harbingers with the ability to fly. American Gods writer Maria Melnik is set to write. In a recent interview with Cinema Blend, Kevin Feige confirmed a sequel to Doctor Strange is in development. Sometimes it’s where do those characters pop up? [Doctor] Strange, you know, whenever we do another Strange one, which we will do, it will be a number of years from the first Strange, and yet he’s a very big part of [Avengers:] Infinity War. So it is just a good problem to have when you have too many beloved characters that people want to see more of, whilst keeping to our core belief that we need to keep exploring nuance and keep doing different types of things. Speaking of doctors, Variety reports Rebecca Ferguson is in talks to play a currently undisclosed character in the adaptation of Stephen King’s sequel to The Shining, Doctor Sleep. Just Jared has set photos of Gal Gadot and Chris Pine fleeing a museum. Meanwhile, a new casting call is looking for “joggers” available to work in Alexandria, Virginia on July 7. Applicants must be available either today or tomorrow for a fitting. This is a really big statement, but this is the closest to modern Stanley Kubrick I‘ve ever seen. You’re put into a world, which I can only describe it as being like ‘The Shining’ in a lot of ways, where you’re just encompassed in a filmmaker’s brain and you’re just implanted in there, and there’s nothing like it that you will ever see. That was a crazy movie to be a part of. Here’s the thing, it’s so secretive that it’s super locked down. It’s secretive and I want it to be secretive because you guys are gonna be so shocked. It is WILD. It’s crazy. I can say this, I speak German mainly in the movie. So you won’t recognize me very well. I seem like a different person and I sound like a different person. James McAvoy posted several behind-the-scenes Polaroids on his Instagram account. A brand-new U.S. remake of The Grudge under a slightly more truncated title has officially begun filming. Coming Soon has the latest poster. Johnny English returns for a third outing on a new poster from Screen Rant. A new featurette takes us behind-the-scenes of Peter Jackson’s latest. Gideon Falls is one of the most inventive stories in comics today, colliding a psychologically complex and intellectually nuanced cast against a stark and terrifying terrain of science fiction and horror. It’s no surprise that it comes from the brilliant minds of two of the most talented creators in the comics medium — Jeff Lemire and Andrea Sorrentino — or that it sparked a massive multi-studio bidding war. Each episode will explore issues that pertain to present-day life in Weird — stories that can only be told through the prism of sci-fi and comedy. TV Guide reports season eight premieres Wednesday, Sept. 12, at 10/9c on FX. The French website Les Toiles Heroiques has character posters from San Diego Comic-Con. Why have character posters for everyone when you could just mash characters together? KSiteTV has images from July 11’s episode, “There In The Disappearing Light.” Head over there to see the rest. KSiteTV also has images from July 17’s episode of The 100, “The Warrior’s Will.” More at the link. Still yet, KSiteTV has images from the series premiere of The Outpost, “One is the Loneliest Number.” Click through for more.